In my last post about my 3 g grandfather, Henry Freeman, I shared that he is pretty much a mystery as I am unable to find anything about him after the birth of his youngest son. Henry's younger brother, Edward, is most certainly not a mystery. While there are aspects that I still am not able to answer,for the most part his life is known. He was born on 11 May 1837 in Barrows, Rutland, England. He is listed as a lad of four years of age in the English 1841 Census. He can be found again ten years later as a teenager in the English 1851 Census. According to the 1910 Census of of Iowa (Clay County) he immigrated to the United States at the age of 20 in 1857. I have not found his point of entry as of this writing, nor have I been able to locate him in the US 1860 Census. On 28 February 1862 he is married to Cornelia Jane Fuller, daughter of Abial J. Fuller and Cordelia Jane (Pettit) Fuller in Spring Green, Sauk Co., Wisconsin. Cordelia's younger sister, Elizabeth (my 2nd g grandmother) would marry Edward's nephew, William M. Freeman (my 2nd g grandfather) 15 years later. Edward also completed a Civil War Draft Registration on 1 July 1863 in Spring Green, Sauk Co., Wisconsin as did his older brother, Henry. There is a notation in Edward's registration that "he claims to have never declared his intentions." There is no such notation in Henry's. Neither brother would go on to fight. Their first child, a son, William Jesse Freeman, is born in 1863 followed by the birth of their first daughter, Elizabeth Cordelia in 1864. Their second daughter, Mary Jane, nicknamed Jennie is born in 1867. Their third daughter, Hattie is born in February of 1870. All the above mentioned children are born in Wisconsin, probably Spring Green, Sauk Co. as they are all listed with their parents in the 1870 US Census in that county. Sometime in the next decade, they would join the Fuller/Freeman migration to Chickasaw County, Iowa. Cornelia's parents would move there (only two of Cornelia's brothers stayed in Wisconsin) as would Henry's widow and sons, William, James, Edward, and Joseph as all are listed in the 1880 US Census of Chickasaw County, Iowa. Edward and Cornelia would add another daughter to their family, Anna, born in March, 1875 in Fredericksburg, Chickasaw Co., Iowa. Five years later they would have a final child, Eddie, who died in infancy. Again the Freeman and Fuller families would make another move sometime before 1885 to Buena Vista County, Iowa. 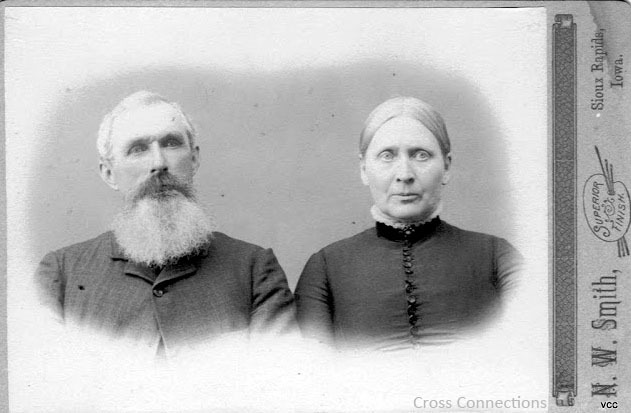 Between 1885 and 1910, Edward and Cornelia would live in Sioux Rapids, Buena Vista Co., Iowa and Spencer, Clay Co., Iowa. Their daughters married and moved to South Dakota. In their later years, Edward and Cornelia can be found living with their children. 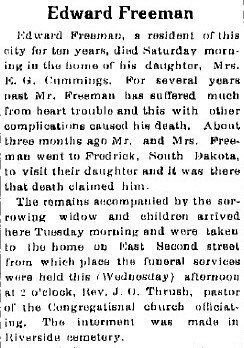 Edward would die in Frederick, Brown Co., South Dakota on 27 February 1915 at the age of 77. On 29 March 1915, Cornelia bought several grave plots in Riverside Cemetery, Spencer, Clay Co., Iowa. Cornelia would continue to live with her daughter until her death in 1928. Both she and Edward would be laid to rest in Spencer. The Freeman family Bible and many, many pictures are in the possession of one of their descendants, as yet unknown to me. The only reason I know this, is in doing research I came across a query by a researcher who had these items in his possession but had given them to this descendant many years previously. This researcher was able to provide me with digital scans of a few of the pictures, which I treasure. Henry and Edward, separated only five years by birth. The older brother lives only a short while but leaves a legacy in those who live on. The younger brother leaves both a personal legacy and a legacy in his descendants. How I wish I could have known both men. Hopefully, at some point, you will be able to connect with that relative who has the photographs and family Bible. The obituary mentions that Edward emigrated with his father. Did you ever find any other mention of the father? Another thought, though a long shot: since Edward seemed to move around, and since his heritage was English, is there any possibility that he/his father ever spent some time in Canada? I know it's a stretch from the town of his marriage in Wisconsin, but I have seen such migrations happen in my own family research. Other than that, Valerie, you do have a mystery on your hands...but isn't it the hunt that makes this all so tantalizing? No, I have not been able to find anything else out about their father. I am wondering if maybe, this was a mistake in the obituary, as can sometimes happen. BUT, I like your idea for searching in Canada. Yes, the hunt is most definitely part of all the fun!